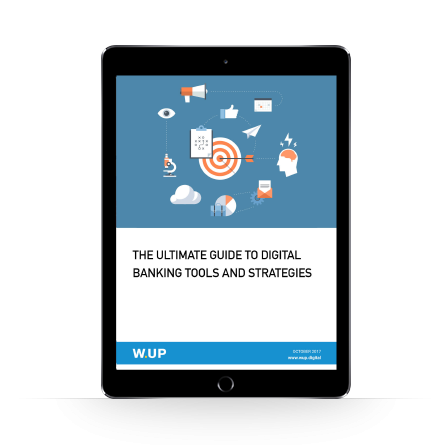 Download W.UP’s white paper to learn about the best practices to prepare banks to effectively tackle digital disruption. To keep their competitive advantage, banks need to develop the right strategy and organization, use the appropriate digital methods and tools, apply the latest fintech developments, understand customers better, form the right partnerships with expert contributors and get proactive with clients. Flexibility and rapid response to changes have never been more important for financial institutions to remain ahead of the competition. This mindset should be at the very heart of businesses, especially when it comes to digital development, where a variety of solutions and novel approaches are already available. Why do I need to provide the information requested? Absolutely. We’d like to share know-how that we hope you’ll find useful. Have questions about digital banking? Get in touch with us! Tell me about W.UP’s proposition.